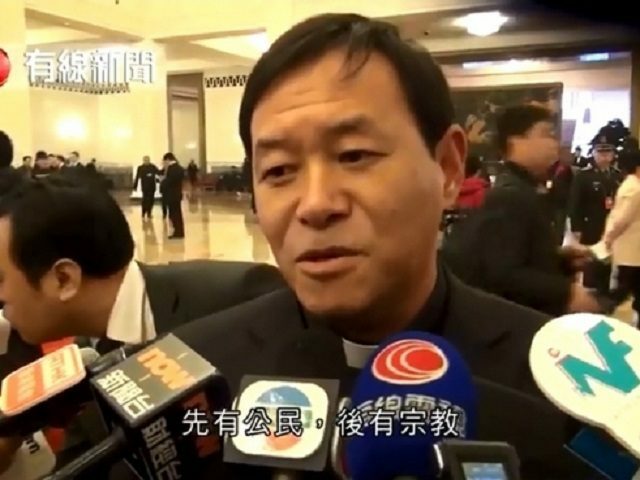 In a statement sure to confirm the worst fears of skeptics of a new China-Vatican deal, a Chinese bishop of the government-controlled Catholic Patriotic Association has said that loyal citizenship must take priority over Christian faith. Bishop Peter Fang Jianping of Tangshan said this week that Catholics should give their allegiance to President Xi Jinping “because we, as citizens of the country, should first be a citizen and then have religion and beliefs,” according to a recent report. Asked about church-state relations, the bishop justified his subordination of the faith to political powers by citing Jesus’ injunction to render to God what is God’s and to Caesar what is Caesar’s. Expressing optimism about a historic agreement between the Chinese government and the Holy See, Fang said that if Rome legitimizes mainland bishops, the move will improve Sino-Vatican relations and allow for greater development of the Church in China. President Xi has made it clear that all religions active in China must be “Sinicized,” or rendered compatible with the beliefs and programs of Communist Chinese culture and cleansed of western influence. Bishop Fang wasn’t alone this week in speaking out favorably of the proposed deal between the Vatican and the Chinese government. In a Chinese media interview at the Chinese Communist Party’s annual meetings this week, two excommunicated bishops also suggested that the accord between China and the Holy See would be beneficial to Chinese society and the work of the Church there. Paul Lei Shiyin, the Patriotic Bishop of Leshan, who was excommunicated by the Holy See because of his unauthorized episcopal ordination, said that diplomatic ties between China and the Vatican would benefit China’s international influence and permit the Church greater leeway for its pastoral work in the country. The new deal being brokered between the Holy See and China’s Communist leadership would reestablish diplomatic ties, which were severed by Beijing in 1951. Not long afterward, China established its Catholic Patriotic Association as a government-controlled parallel church with no allegiance to Rome. The deal reportedly includes the provision that Pope Francis will legitimize seven excommunicated bishops in China who were ordained without Holy See approval, as well as giving the Chinese government an unspecified role in naming Catholic bishops in the country. Some 12 million Catholics are believed to currently be living in China, split roughly 50-50 between the Catholic Patriotic Association and the illegal “underground Church” of those faithful to Rome. Wang Zuoan, director of the State Administration of Religious Affairs (SARA), told media this week that China has always striven to improve Sino-Vatican relations, while describing communications between the two parties as effective and smooth. The new norms overhauling religious practice in the officially communist country were drafted by the same State Administration for Religious Affairs and include the imposition of massive fines for persons associated with underground religious communities not authorized by the state, which have no legal standing in the country. Last month, Chinese authorities sent more than 100 Christians, mostly converts, to “re-education camps” to learn loyalty to the country’s ruling party, according to reports. A year ago, Pope Francis publicly defended China’s practice of religious liberty, in what many observers described as an effort at appeasement in a bid to establish formal diplomatic ties with the country. In an interview with the Spanish daily El País, Francis insisted that in China, churches are full and religion is practiced freely, adding he would love to visit China “as soon as they invite me,” something he says he has made clear to Chinese authorities. The chancellor of the Pontifical Academy of Sciences has praised life in China, insisting that the atheistic communist regime has created the best model for living out Catholic social teaching today.